Lincoln Center for the Performing Arts is a complex of three main buildings and a selection of facilities for indoor and outdoor performances. It is the largest performing arts center in the world. Created as part of the urban renewal project of Lincoln Square, as propagated by Robert Moses in 1950s and 1960s, the three main buildings opened in 1962 (David Geffen Hall, formerly known as Avery Fisher Hall), 1964 (Metropolitan Opera House) and 1966 (David H. Koch Theater, formerly known as the New York State Theater). The Metropolitan Opera House, David Geffen Hall and David H. Koch Theater are well known around the world for their concerts, opera and ballet performances respectively. The famous Juilliard School is also located in Lincoln Center. The center itself is large – boasting 16.3 acres – and is the place to go for a perfect night out; to enjoy one of the many performances the center offers. Lincoln Center praises itself for having the highest standards for excellence in symphony, theatre, dance, opera and musical education. Tickets, however, are very hard to come by. At the beginning of the season, most of the tickets sell out as both ballet and opera performances are renowned and popular. 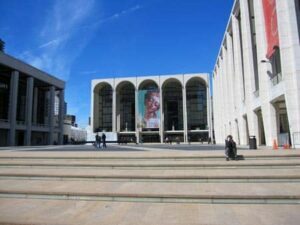 Lincoln Center is located in the Upper West Side, between West 62nd and 65th Streets and Columbus and Amsterdam Avenues. You can take the subway 1 uptown runs to 66th Street/Lincoln Center Station which is the closest stop. You can also take subway A, C, D to Columbus Circle and walk north, you can’t miss it! Yes, you can take a tour of Lincoln Center. With the New York Pass you can take a guided tour behind the scenes and see all stages of the prestigious venues such as the Metropolitan Opera House, David Geffen Hall and David H. Koch Theater. Your guide will tell you about the history of the buildings and you might even be able to see a rehearsal in progress! There are a number of good places close to Lincoln Center and whether you fancy a quick bite, or a elegant Michelin Star dinner, below is a selection of preferred restaurants within walking distance of the Lincoln Center that cover either taste palette. Some people don’t like to have a heavy meal before watching a performance. There are a few options for a quick bite close to Lincoln Center. You can start your cultural evening by enjoying a glass of fine wine and a snack at the rooftop bar of either the Mandarin Oriental or Empire Hotel. Alternatively, you can have a real New York experience by enjoying the food of a local diner. I recommend Olympic Flame Diner on West 60th Street. On 10th Avenue you’ll find Boston Market where you can enjoy amazing fresh chicken; pure comfort food. Why not try something crazy like sweet potatoes with marshmallows? In both these places you can be in and out in about half an hour. Do take enough time to walk back to the Lincoln Center and be seated before the performance starts. If you have a little more time and want to enjoy a good meal, then you could try Blue Ribbon Sushi Bar&Grill. It’s not cheap but the sushi is delicious and they’re open every day. The restaurant is located next to Columbus Circle. You enter through Columbus Hotel. If that’s a little too fancy for you then check out Limón Jungle for good fresh Mexican food on the 9th Avenue. If you really want to treat that special someone to a night out, including an amazing dinner, then there are two places that are guaranteed to make an impression. Robert NYC is a restaurant on the top of a museum with a wonderful view of Central Park. It’s chic, it’s classy. It’s actually inside the Museum of Arts and Design on 2 Columbus Circle, you can decide to pop into the museum beforehand if you like, but if you just want to head straight to the restaurant than you needn’t pay an entrance fee. If you feel like having a good steak but your partner doesn’t, head to Porter House. Located in Columbus Circle on the 4th floor, they serve American style steaks but also seafood and pasta. They are open from 17:00 onwards which makes it a good place to eat if you are continuing to see a performance at the Lincoln Center.